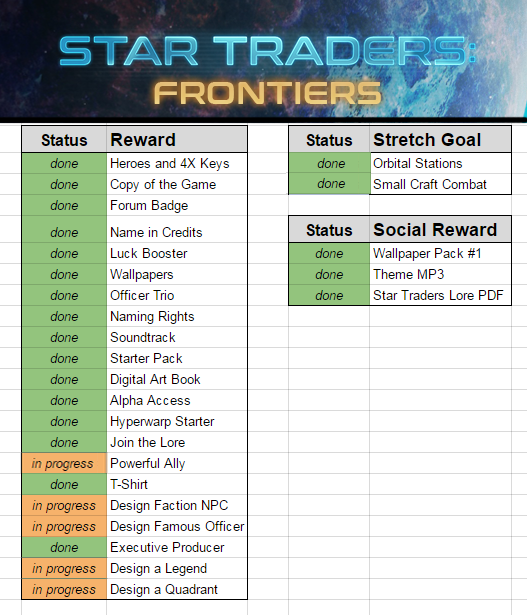 Just posting this update here, for those who may be like myself in waiting for device sync’ing to get sucked into Star Traders: Frontiers (I backed it on Kickstarter back in 2014, so it’s not like I’m withholding financial support until they meet my demands, it’s more that I’ve been waiting 4+ years already after funding this to start playing, so I’ll wait a bit longer). Any plan to make saves cross platform? I have the game for my phone and on steam just wondering if there’s any plans to make a way to play my saves back and forth? Yes, we are hoping to be able to achieve that eventually, but are committed to delivering our Kickstarter rewards first (fighters and carriers). So many games so little time, but damn I am a sucker for Carrier/Strike-Craft Combat in Science Fiction Settings. We have now delivered the Small Craft Stretch Goal which marks a big milestone in the life cycle of the Star Traders: Frontiers KickStarter. We have hit the final stretch goal and the final feature reward promised for the game. We have now completed every non-creative reward. With this major feature behind us, we are now turning all of our attention to adding the remaining backers’ creative content to the game with new story arcs, vignettes and eras. The mobile patch is now online as well, see that patch notes? I’ve read novellas shorter than that…need to get in the game…carrier combat in space me like a LOT! Oh, boy, do I need to get around to this game at some point. I’m working on the backlog and this one is in the future, when I’ve cleared out the garbage and mediocre tier games. You should clear out faster lol. This will be my 4th character. It’s so good.